With its old world grandeur, winding cobblestone streets, and horse-drawn buggies, it simply does not get any more scenic than this for wedding photography. Great light happens in the Old Port at about 4:00 in mid-summer, when the sun goes behind the buildings and everything is bathed in a soft, even light: perfect light for photography. If you want a look that’s quintessentially “Montreal” for your wedding photos, head on down to Montreal's World Trade Center. This massive indoor space was once “Ruelle des Fortifications” one of Montreal’s oldest streets. Today, there’s a glass ceiling over the old street, and a row of chic boutiques where there once was a bustling farmer’s market. Next to the boutiques, there’s a gorgeous black reflecting pool that looks spectacular in photos, as well as huge gas lamps, a stone goddess in a fountain, and lots steps for posing big groups. It’s very, very nice! The World Trade Center is also the perfect place to go if it rains, as it’s covered. But be forewarned—every other photographer also goes there when it rains, so you’re competing for space with many, many weddings on rainy summer weekends. If you are after edgy and urban wedding photography, there’s no better place for photos than the Old Montreal. There’s old brick warehouses, railway tracks and pretty views of the Lachine Canal. With its mature hardwood trees, winding paths, duck pond, waterfall and old, wrought iron fences, Westmount Park is a green oasis in downtown Montreal, and an ideal spot for wedding photos. There’s also a breathtaking Victorian greenhouse filled with luscious plants. It's currently close for renovations, but the City of Westmount is working hars to reopen this magnificent structure soon. 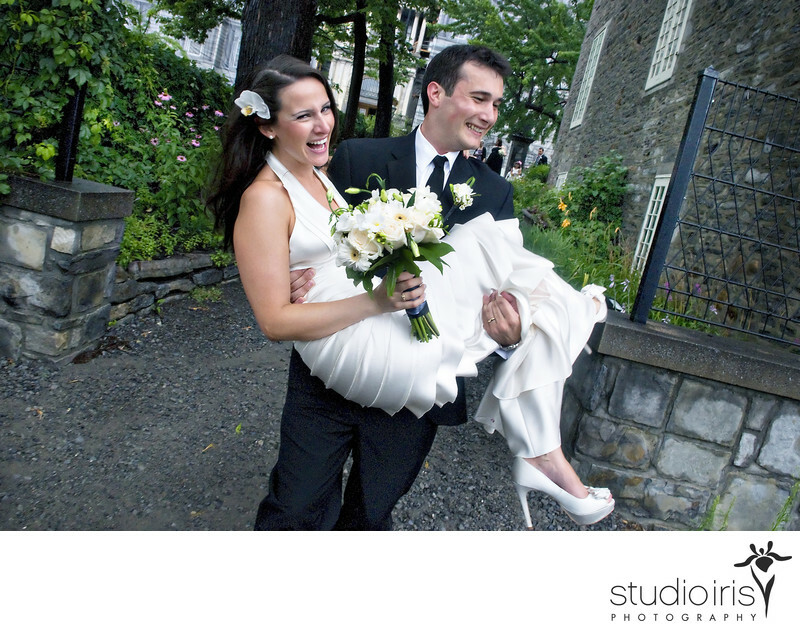 Montreal’s Botanical Gardens are a marvelous place for wedding photography. My favourite places are the exhibition gardens, the flowery brook, the lilac gardens (heavenly in June) and the Chinese garden. With the Access Card, entry to the exterior gardens is free for Montreal residents. Bois Franc is a pretty little park with a stone bridge, European-style walk-ups and a pretty white bandstand with a domed copper roof. A great solution for wedding in this part of Montreal, as there aren't too many places to go in the area.